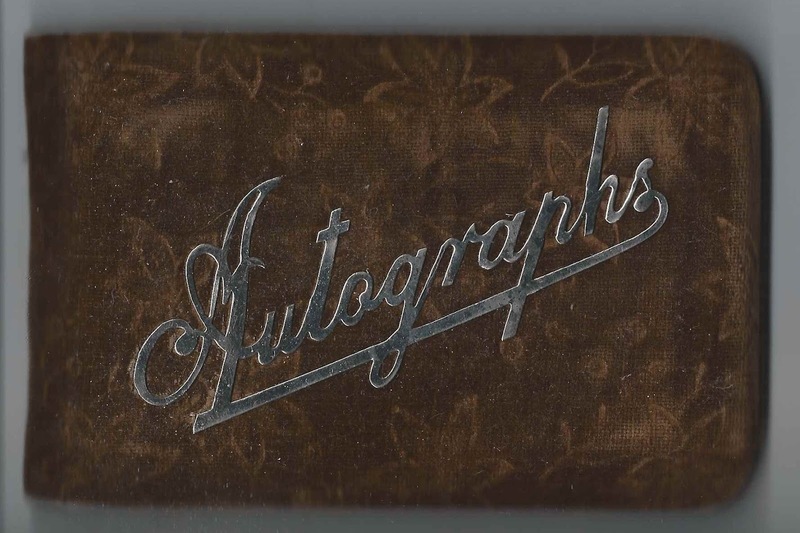 Autograph album presented by George Eben Hill at Christmas in 1893 to his grandmother, Hannah Winslow (Thurber) Smith Wentworth, at Franklin, Maine. 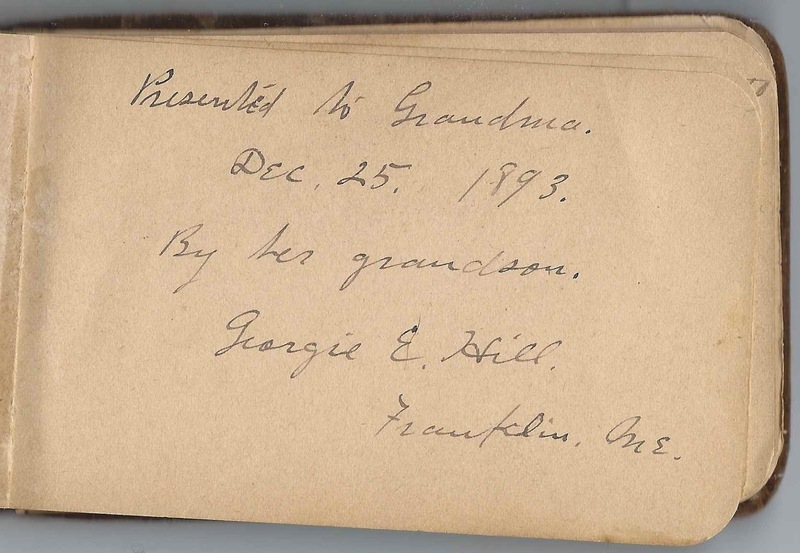 Hannah's name wasn't spelled out, but two people in the album called her grandmother; Hannah was their common denominator. George Eben Hill was the son of Ebenezer Hill and Phoebe Nickerson (Wentworth) Hill, Hannah's daughter from her second marriage, to Joseph Card Wentworth. 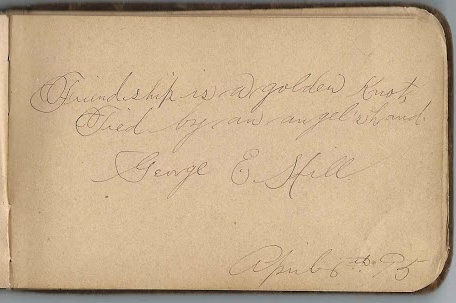 George signed another page on 6 April 1895, although his handwriting looks a tad different. 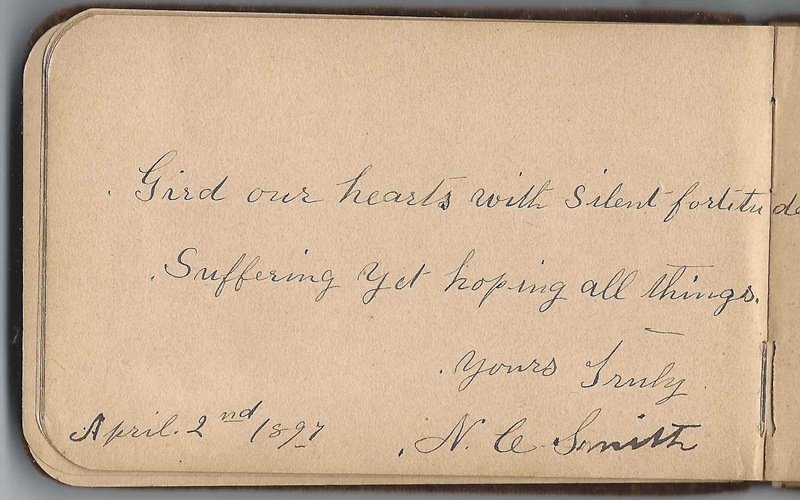 The album is approximately 5-1/2" x 3-1/2" and contains the sentiments of about 20 of Hannah's relatives and friends. An alphabetical list of the signers appears at the end of this post. 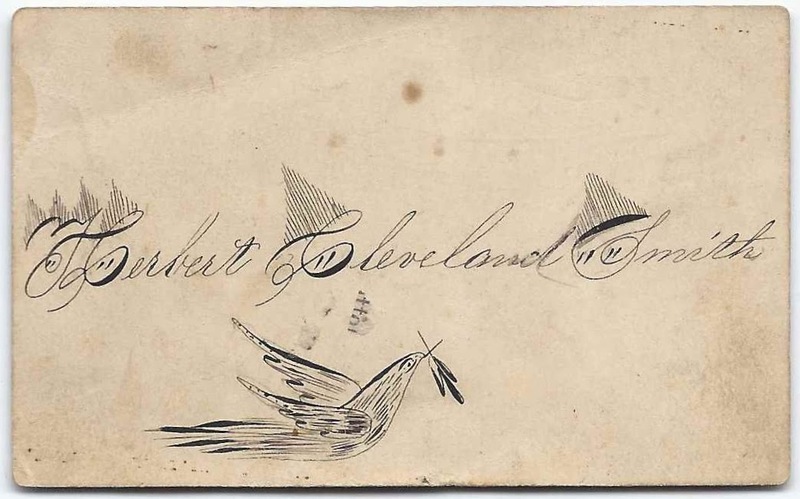 Tucked inside the album is the calling card of Herbert Cleveland Smith. 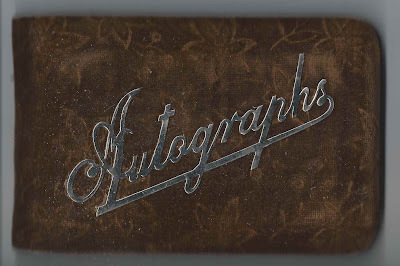 The album covers are faded velvet with a floral design; attached to the front cover is the word "Autographs" in metal. Another of Hannah's grandchildren signed several pages in her album; thankfully she called herself a granddaughter on one of them. Ina Phoebe Smith was the daughter of Nancy C. (Foster) Smith and Charles Joseph Smith, Hannah's son from her first marriage to Captain Joseph Smith. 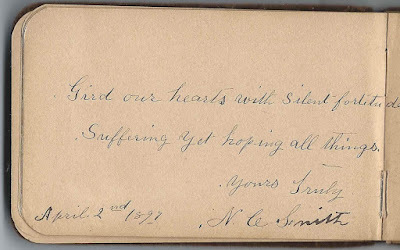 Ina's mother, Nancy C. (Foster) Smith, presumably, was the N. C. Smith who signed a page in the album, also on 2 April 1897. Hannah Winslow (Thurber) Smith Wentworth was born 11 August 1821 at Trenton, Maine, the daughter of Benjamin and Mary (Winchester) Thurber, who were born in New Brunswick and Nova Scotia, respectively. I found a marriage intention record between Joseph Smith of Ellsworth and Hannah W. Thurber, then residing at Walpole, at Walpole, Massachusetts, on 23 May 1846. According to a Massachusetts marriage record, they were married 7 October 1846, at Cambridge, Massachusetts. 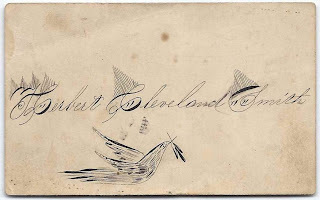 Charles Joseph Smith, born about April 1846, give or take a year, in Charlestown, Massachusetts. If he is the Charles J. Smith in a certain Civil War record, he may have been born before Joseph and Hannah's marriage; perhaps, even, his father was someone else. His daughter Grace Evalaide (Smith) Savage ordered a Military Headstone, a record that showed Charles' dates of service as 19 September 1861 to 31 July 1865. His age of enlistment on the Soldier Record and Profile showed his age as 18, but he may have added a year or several to his age, which was not uncommon. Alphonzo W. Smith, born about 1848. Son Charles Joseph Smith married Nancy C. Foster on 25 September 1869 at Ellsworth, Maine; both were then residents of Franklin, Maine. Nancy was born at Trescott, Maine on 8 July 1852, according to her death record. She was the daughter of Richard and Nancy (Agett ?) Foster, who were natives of Saint John, New Brunswick, according to her death record. Charles and Nancy's daughter, the above mentioned Ina Phoebe Smith, was born 22 August 1886 at Franklin, Maine. Ina married George A. Linscott in 1903. George was born at Hancock, Maine, on 21 October 1881, son of Lorenzo M. and Harriet (Lord) Linscott. After the death of Captain Joseph Smith in 1850, Hannah Winslow (Thurber) Smith married Joseph Card Wentworth, son of Moses and Sarah (Hooper) Wentworth. Joseph was born 9 August 1823 at Franklin, Maine. George Eben Hill, who presented the album to Hannah at Christmas 1893, was the son of Phoebe Nickerson Wentworth and her husband Ebenezer Hill. According to his World War I draft registration card, George was born 29 December 1875; his marriage record gave his birthplace as Wells Beach, Maine. George married Minnie Sadie Wells, daughter of Nahum and Olive (Manuel) Wells. Minnie was born 21 February 1876 at Kennebunk, Maine, according to her birth and marriage records. 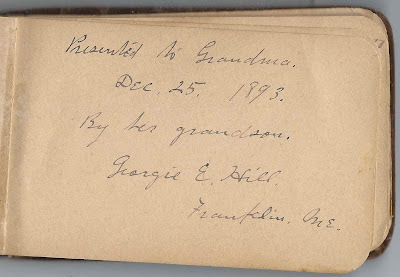 Georgie E. Hill of Franklin, Maine; presented the album to his grandmother Hannah Winslow (Thurber) Smith Wentworth on 25 December 1893. George Eben Hill's mother, Phoebe Nickerson Wentworth, was Hannah's daughter from her second marriage, to Joseph Card Wentworth. George's father was Ebenezer Hill. 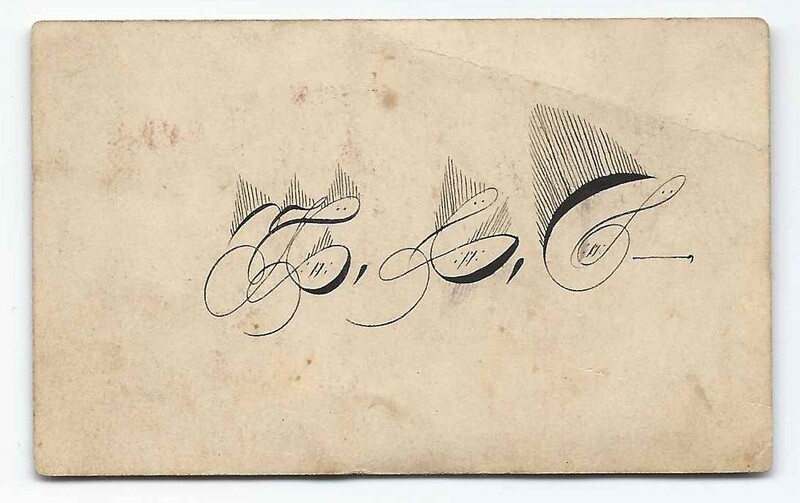 I believe it was George who signed another page in 1895, though his handwriting is a bit different. George E. Hill, signed on 6 April 1895. 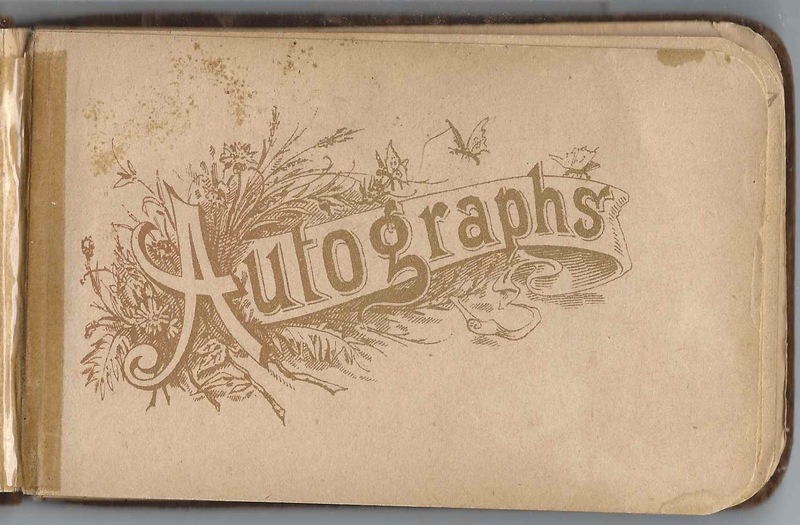 He may be the Georgie E. Smith who signed the presentation page, though the handwriting is a bit different. 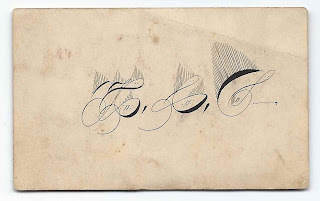 Gertrude Moore, or Moors, of Egypt, Maine, signed in 1897. 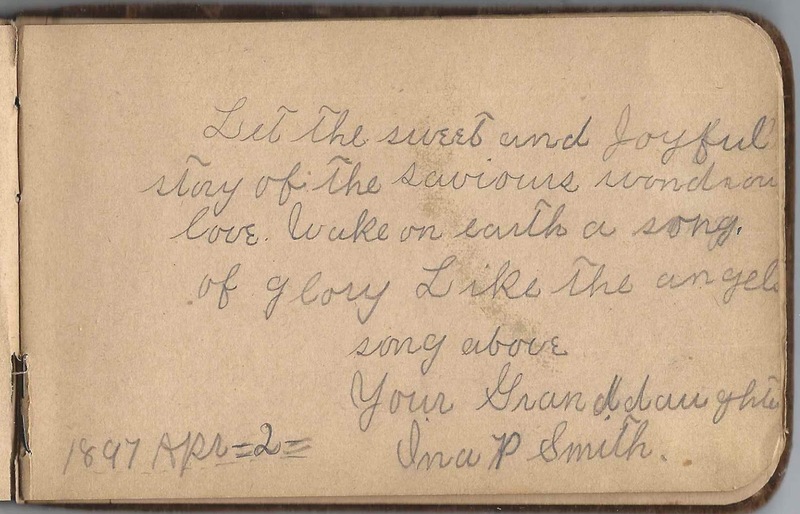 Herbert Cleveland Smith - his calling card is tucked in the album. 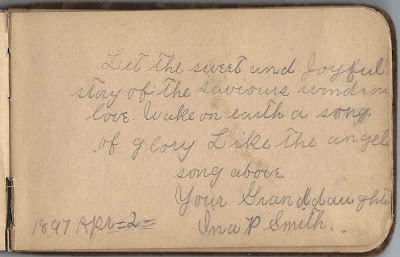 Ina Smith, signed on 15 October 1903; presumably another page signed by Hannah's granddaughter Ina P. Smith in 1897.